Natural sunlight can be energizing in the workplace but it can also decrease productivity if the glare becomes too intense and causes over-heating. Many businesses, stores, restaurants and hotels rely on durable yet stylish blinds and shades to keep their businesses cool. Save energy costs. Adding blinds or shades on your office windows add another layer between your office and the outdoors. Whether you’re trying to conserve heat or keep it out blinds will help regulate the temperature. Privacy. Beautiful big windows isn’t necessarily a bad thing, but if you’d rather not have the entire office or neighbors watching you during an intense meeting adding shades or blinds to a conference room might be a wise choice. Improve the general look of your office or business. Believe it or not your business’s window treatments have an impact on how visitors view the space and your company. Clean and put together drapery gives off the impression that your business is well put together. Plain white blinds can make a space less impressive and less authoritative. Control the glare. Nothing is worse than wanting natural light but constantly squinting or holding your hand up in front of your computer screen as an attempt to block the light and read. Control the glare by adding blinds or shades to your office to block the harsh sunlight while still adding a soft glow. Low maintenance and low costs. Adding blinds or shades are a way to give your office an updated look at an affordable cost. Blinds and shades are easy to clean and do not require as much routine maintenance. Make your office or business more comfortable with the touch of a button! Motorized blinds can be programmed to open and close at different times of the day based on your needs. By programming blinds to open and close at various times in the day, you can create the perfect ambiance in the morning, noon and night! 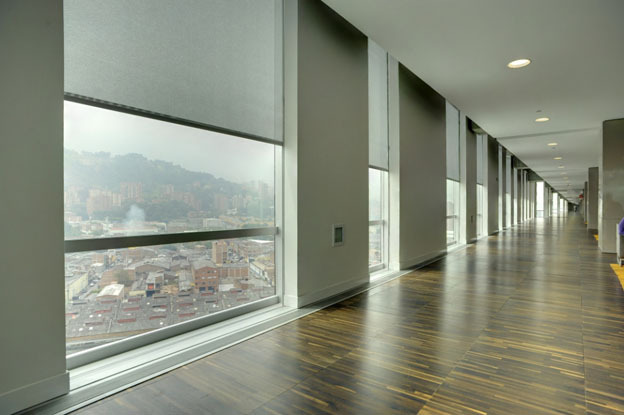 Add style to any business with commercial blinds and shades from SmartLooks. Give us a call today at (972)-699-1151.